The cell. 6. Peroxisomes. Atlas of plant and animal histology. La célula. 6. Non vesicular. Peroxisomes are in charge of several metabolic reactions, mainly oxidative reactions (consume oxygen). Urate oxidase and catalase are ezymes typically found in peroxisomes. In plants, peroxisomes carry out photorespiration and are storage organelles in seeds. Peroxisomes originate from the endoplasmic reticulum or by splitting already existing peroxisomes. Peroxisomes are membrane-bound organelles, more of less rounded, and between 0.1 to 1 µm in diameter. They can be found in all eukaryotic cells, and have a prominent metabolic role, sometimes the concentration of enzymes they have inside is so high that enzymes become crystals. Peroxisomes cooperate with other organelles in many metabolic pathways (see table below). 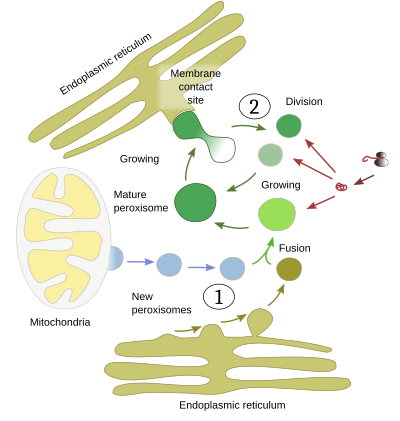 In plants and fungi, β-oxidation is confined to peroxisomes, whereas, in animal cells, β-oxidation is also carried out by mitochondria. In plants, peroxisomes can reduce products from CO2 fixation by a process known as photorespiration, where oxygen is consumed and CO2 is released. In seeds, however, peroxisomes store fatty acids that are transformed in carbohydrates during germination. These peroxisomes are known as glyoxysomes. It is noteworthy that when photosynthesis starts, after the first leaves have developed, glyoxysomes become normal peroxisomes in the mature cells of leaves. In trypanosomes, malaria parasite, glycosomes are a type of peroxisome where glycolysis happens. The different types of peroxisomes are known altogether as microbodies. Peroxisomes are adaptable organelles. They can increase in number and size according to the cell needs and be restored to the normal levels after they complete their role. When peroxisomes are removed, the cell is able to produce new peroxisomes. Biogenesis of peroxisomes may happen by growing and division from preexisting peroxisomes, and by new ones emerging from the endoplasmic reticulum. a) Cytoplasmic peroxisomes acquire proteins synthesized by free ribosomes. In the peroxisome membrane, there are transporters known as peroxins, which recognize and transport molecules into peroxisomes. Proteins targeted to peroxisomes have amino acid sequences known as PTS1 and PTS2 (peroxisome target sequence), which are recognized by peroxins. Metabolic enzymes are translocated across the membrane, but some proteins are targeted to the peroxisome membrane. Addition of new molecules makes peroxisomes mature and grow. When peroxisomes reach a certain size they divide in two. b) Endoplasmic reticulum can also be involved in the growth and proliferation of peroxisomes. From endoplasmic reticulum cisternae, by evagination and fission, vesicle-like structures are formed with all the typical molecules found in peroxisomes, and eventually they fuse between each other to form mature peroxisomes. However, even existing peroxisomes may receive some of these vesicle-like structures, which provide molecules to the peroxisome membrane and to the pool of inner enzymes. This path does not need COP-II coats. Life cycle of peroxisomes. Proliferation: 1) from the endoplasmic reticulum, 2) by growing and fission. Incoming molecules for growth and maturation: A) from cytosol, B) by fusion of vesicle-like structures coming from the endoplasmic reticulum by a COP-II independent process (modified from Smith and Aitchison, 2013). Peroxisomes are distributed through the cytoplasm thanks to interactions with microtubules and actin filaments. These interactions also allow them to change the morphology and move away the two new peroxisomes after division. Different metabolic functions of peroxisomes and the eukaryotic type of cell where occur (from Smith and Aitchison, 2013). Smith JJ, Aitchison JD. 2013. Peroxisomes take shape. Nature reviews in molecular and cell biology. 14. 803-817.